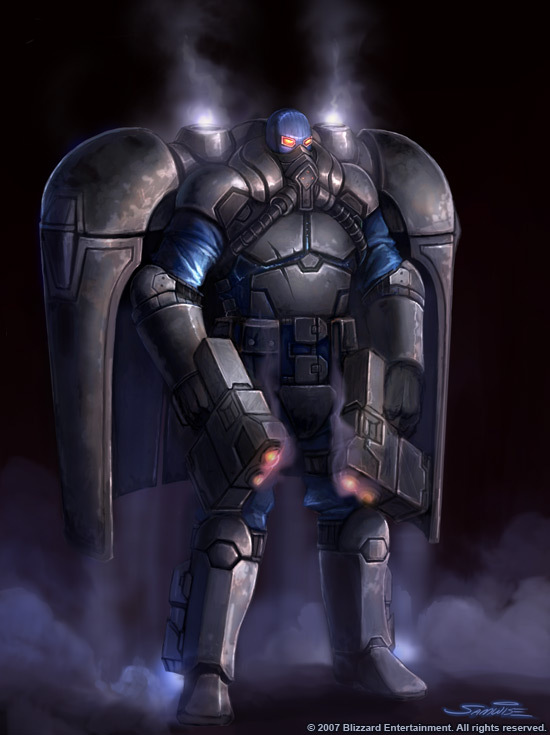 Reapers - Jet-pack-equipped mobile infantry, wearing light battlesuits and wielding twin submachine guns for soft targets, grenades and mines for vehicles and structures. Secondary Characteristics: Damage 1d/2d-1; BL 34 lbs. ; HP 15 ; Will 10 ; Per 10 ; FP 12 ; Speed 6.00 ; Move 6 . Advantages: Akimbo (Rifle, Shotgun, or SMG) ; Combat Reflexes ; Fit ; Military Rank 0 (Private) . • Either Ambidexterity , or spend an additional 5 points on optional template advantages. • Another 20 points chosen from among improved Attributes or Secondary Characteristics, Born War Leader [5/level], Brave , Fearlessness [2/level], High Pain Threshold , Lifting ST 1-2 [3/level], Military Rank 1 (Corporal) , Quick Reload (Detachable Magazine) , Rapid Healing , Resistant to Disease (+3) or (+8) [3 or 5], Resistant to Poison (+3) , SOP (Last Man Out, Point Man, etc) [1/perk], Weapon Bond (any starting weapon) [1/weapon], upgrade Fit  to Very Fit  for 10 points, or Cyberware. Disadvantages: Code of Honor (Soldier's) [-10]. • Another -20 points chosen from among Bloodlust [-10], Chummy [-5] or Gregarious [-10], Curious [-5] or Incurious [-5], Gluttony [-5], Guilt Complex [-5], Gullibility [-10], Hidebound [-5], Impulsive [-10], Intolerance (Protoss or Zerg) [-5] or (Non-Terrans)[-10], On the Edge [-15], Overconfidence [-5], Pyromania [-5], Sense of Duty (Teammates) [-5] or (Terran Army) [-10], Stubbornness [-5], or other non-crippling mental disadvantages. 1. (Pulse Rifle): Fast-Draw (Longarm) (E) DX+2 ; Guns (Grenade Launcher and Rifle), both DX+2 . 2. (Gauss CAW): Armoury (Small Arms) (A) IQ+2 ; Fast-Draw (Longarm) (E) DX+2 ; Guns (Shotgun) DX+2 . 3. (Twin Gauss Shotgun Pistols): Fast-Draw (Pistol) (E) DX+1 ; Guns (Shotgun) (A) DX+2 ; Dual-Shooting (Shotgun) (H) Skill+0 . 4. (Twin Gauss SMGs): Fast-Draw (Pistol) (E) DX+1 ; Guns (Submachine Gun) (A) DX+2 ; Dual-Shooting (Submachine Gun) (H) Skill+0 . Secondary Skills: Climbing (A) DX ; Electronics Operation (Comms) (A) IQ ; First Aid (E) IQ ; Guns (Rifle, Shotgun, or SMG) (E) DX+2 ; Guns (additional, from default) (E) DX+1 ; Hiking (A) HT ; Judo (H) DX ; Jumping (E) DX ; Karate (H) DX ; Knife (E) DX ; Running (A) HT ; Savoir-Faire (Military) (E) IQ ; Soldier (A) IQ ; Spacer (E) IQ ; Stealth (A) DX ; Swimming (E) HT . • Choose three of Armoury (Battlesuits, Body Armor, Heavy Weapons, or Small Arms), Artillery (Guided Missile), Electronics Operation (EW, Security, or Sensors), Explosives (Demolitions or EOD), or Forward Observer, all (A) IQ ; Driving (Heavy Wheeled, Hovercraft, or Mecha) or Piloting (Aerospace or Vertol), all (A) DX ; Fast-Draw (Ammo, Knife, etc) (E) DX+2 -14; Gunner (Beams, Cannon, Machine Gun, or Rockets) or Guns (GL or LAWS), all (E) DX+1 ; Intimidation (A) Will ; Mechanic (any known Driving or Piloting specialization) (A) IQ ; Navigation (Land) (A) IQ ; Survival (Low/No Atmosphere or Toxic Atmosphere) (A) Per (A) ; or spend 2 points to raise one of those skills by 1 level. Background Skills: Computer Operation (E) IQ . • Another 4 points chosen from among Carousing (E) HT ; Connoisseur (any) (A) IQ-1 ; Current Affair (any), Games (any), or Hobby Skill (any), all (E) IQ ; Driving (Automobile or Motorcycle) (A) DX-1 ; Gambling (A) IQ-1 ; Mechanic (Automobile or Motorcycle) (A) IQ-1 ; Scrounging (E) Per ; or other background/hobby skills. Standard Loadout: “Reaper” (Jet-Pack) Light Powered Combat Suit; Neosteel Combat Knife; 64mm Smart Grenades & Limpet Mines. • One of: Dual Gauss Heavy Machine Pistols (8mm), Dual Gauss Shotgun Pistols (18.5mm), Storm Carbine (10mm, w/ 40mm HEX & Thermobaric grenades), or Gauss Combat Shotgun (18.5mm). Suit + 125 lbs (Light Encumbrance).